I have seen this story of Achilles told from the perspective of Patroclus in The Song of Achilles, and I have watched the movie Troy, but it was so refreshing to look at is through the eyes of Briseis, a woman. Briseis is a captured and becomes Achilles war prize, and I believe that her story is often romanticized. I greatly appreciated that Pat Barker gave us an honest and realistic account of what Briseis truly would have been feeling and experiencing. We live inside her head and it allows the reader to feel completely connected her to her. It was so raw that it was hard to read at times. From the beginning I was so blown away by Pat Barker’s writing that I was even compelled to tweet about it. I can not remember the last time I read a book where I wanted to highlight a quote on every page. Her descriptions are so vivid that there were times where I had to put the book down because the scenes were so graphic or emotional that I needed a break in order to recover. I am sure most of you know the plot of The Iliad and The Odyssey by now, but the retellings will never get old for me. It is such an interesting story and every new book I read about it gives me a new perspective. I finished The Silence of the Girls and I now see the story in a whole different way. I had never truly considered what it must have been like for women. I have yet to read The Iliad and The Odyssey which needs to change. I need to read the original subject material that inspires so many gorgeous retellings. As beautiful as the writing was, I found that the pacing was very slow at times. There were moments where I thought it was maybe too descriptive and repetitive. There will obviously be a lot of comparison made between A Song of Achilles and The Silence of the Girls, but I think they both have their own merit. 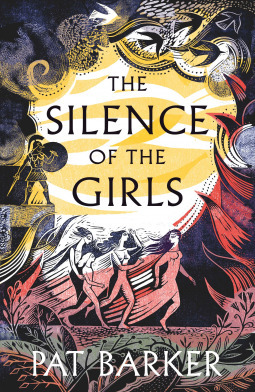 If you are wondering if The Silence of the Girls is worth reading since you have already read A Song of Achilles, the answer is a big YES!! You will look at this story in a whole new way! I’m so happy to see someone review Silence of the Girls as it’s on my priority TBR and I just needed a push to read it and you offered me just that. I love your review, the quote you included and how you compared it to TSOA since I think we will all do it 🙈 It sounds like an amazing book, ever since I’ve read its blurb, I knew that I’ll love the way the war is being told from the women’s perspectives. I’m glad to hear the execution of the idea is great too! It is so fantastic! I might have even enjoyed it more than TSOA! It was such a fresh perspective that I greatly appreciated. I am excited for you to read it and to hear what you think! I have read about the pace and it being to slow! But I don’t know, it really calls my attention, I love The song of Achilles and I would like to see the other perspective! I understand that brings “sold” or being given as a price for sure is not nice but at least on The Song the things where not that bad… like… they in a way saved them but I am scare to see how all that happens in this book :O thank you for sharing! I really think you will enjoy this one! It is worth pushing through the slow parts. It is a refreshing perspective! It is definitely a harsher look at Achilles in this book but you do get to see all sides of him. I still adore Patroclus which is great! Hmm there’s still things I like about him but I actually think I understand him more now! That it so nice! Thank you! I have this book on my tbr ever since I first heard about it, and now I’m even more excited to read it! I agree, the retelling of the Trojan War and events surrounding it would never get old! So true! I really think you will love this one! So happy you loved this!! This is definitely one of my books of the year. Pat Barker’s writing was gorgeous and her characterizations were pitch-perfect. I really hope you enjoy the Iliad and the Odyssey; I’m a BIG Iliad fan but kind of lukewarm on the Odyssey (most people are the opposite so I must just be weird). If you need advice on translations before picking them up do let me know! That is interesting! I am making it a goal to read them in 2019 so when I go to buy them I will definitely reach out to you. Thanks, Rachel!